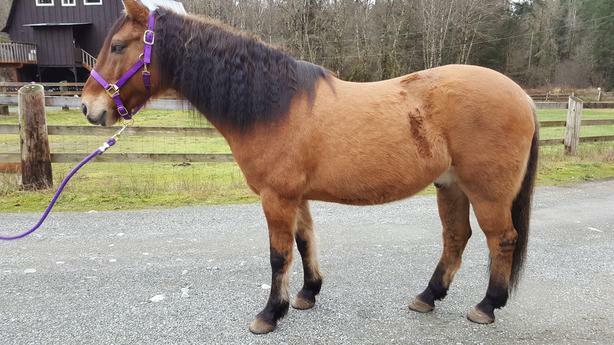 13 yr old Dun Mustang gelding. 15.2 hh. Very handsome and sweet. Loves his people and loves being groomed. Green as he has only been broke for 3 years with intermittent riding. Has all the basics in him, stop, back up, side pass etc. Healthy, sound, easy keeper and has excellent feet. Doesn't need shoes. Excellent with ground work. No bite, buck, kick. Still green and needs miles and confidence. This boy is a bit jumpy so we will only be selling him to someone that is experienced and prepared to work on building up his confidence. He came to us not being able to load in a trailer. We had our Coach work consistently with him and he now loads beautifully but he prefers to face the back of the trailer and there is no convincing him otherwise LOL. He was wild for the first 4 years of his life before he was rounded up in South Dakota.